Sporadic tropical rains, intense sun and hot climate. Air temperature can reach up to 30C (86F). Humidity is high. March 21st, the beginning of the summer equinox, signals the arrival of the waved albatross to Espa ola. Snorkelers can remain long periods of time in the water. 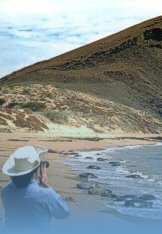 Massive arrival of waved albatrosses to Espanola. Amazing courtship starts. Southeast trade winds return. Currents become a bit stronger. Seas pick up in surge and wave action. Many red pouches by males of Magnificent Frigatebirds on North Seymour. Southern migrants have started their journey towards the north. Galapagos is a rest stop for such birds. Some species of cetaceans also follow this pattern of migration. Sea bird communities are very active (breeding), especially the Blue Footed Boobies on Espanola. Flightless cormorants perform beautiful courtship rituals and nesting activities on Fernandina. 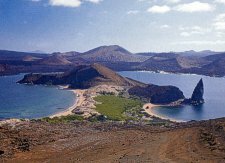 If you walk along the shores of Puerto Egas (Santiago Island), you could find American oystercatchers nesting. Great month to see the four stages of nesting in Blue Footed Boobies: eggs, chicks, juveniles and sub-adults. The temperature of the ocean drops to 18C (64F), which obviously varies according to the geographic zones among the islands. Sea lion pupping season has started. Western and central islands are common places for such sightings. Galapagos Penguins show remarkable activity on Bartolome. Since May, swimmers and snorkelers can be delighted at Bartolome with penguins active at the surface or torpedo-like while underwater. Sea lions are very active. Females have reached estrus stage and so harem-gathering males are constantly barking and fighting. Shore fighting is heavy. 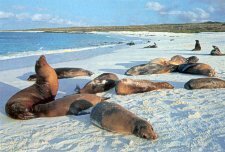 Western and central islands are the most active ones in terms of sea lion activities. Most species of sea birds remain quite active at their nesting sites. Days are not always sunny. Garua (mist) can be expected in most locations except the western islands where most days have a misty start, but after a few hours of daylight, it burns off. Sunrises in the west can be quite beautiful after the garua covers only certain locations of the western volcanoes. Summits are clear, but low-lying fog covers the shoreline. Pupping of sea lions continue. Sea lions are sexually active on the eastern part of the archipelago. Some species of jellyfish can be seen around the islands. The genus Physalia is commonly seen floating around Gardner and Tortuga Islets. Some can also be seen stranded at the shores of the Flour Beach at Floreana. Seas are calm. South east trade winds have decreased strength. Water temperatures are slowly rising. 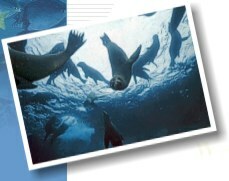 Sea lion pups (especially at Champion Islet) play aqua-aerobics next to snorkelers. Most pups here are curious enough to nibble at fins of snorkelers. The average age of most pups is 3-4 months. The rainy season begins, all of the plants of the dry zone produce leaves. Galapagos becomes "green"
Great weather. Mostly sunny days. Hardly any wind from the south east. Waters continue to warm up. Western islands remain very dry. Water temperature still cool for long snorkeling periods. First red pouches of Great frigatebirds seen at Genovesa. Nothern migrants have started their journey towards the south. Galapagos is a rest stop for these birds. Some species of Cetaceans also follow this pattern of migration.